I admit it, I'm proud of my publishing credits for short works. On my website, there's a complete list of my stories for kids and another list for adults. Adding new works to those lists gives me a great sense of accomplishment. But once a story is published, then what? Most fade into obscurity, if they don't actually go out of print (or get taken down from a website). "Sell them again as reprints!" you're saying. Sure, that's a possibility for grown-up sci-fi. But have you ever tried to sell kidlit reprints? Mighty tricky. Enter the licensing service, a new concept in my authorial life. Alfie Dog Fiction and Schoolwide Inc. both take already-published children's stories, so long as you hold the right to reprint them. They take new stories too, of course. I've decided to offer new stories to Schoolwide and reprints to Alfie Dog. The latter has a spectacular response rate of under a week! This is definitely not so for Schoolwide: expect to wait a few months. Both sites accept book-length works, too, and Alfie Dog takes fiction for adults as well as children. From the consumer's point of view, licensing services work sort of like iTunes. The reader picks the story she wants and pays to download it. On the author's end, there are royalties paid per download, with no advance. I am not far enough into my relationship with Schoolwide to comment on their actual payment practices, but Alfie Dog's royalty statements are prompt and transparent, occurring quarterly. There is a minimum that must be met before a payout, but that's not uncommon for a small press. I don't say you'll get rich parking your reprints on licensing sites. However, even a few cents per story is more that the big fat ZERO your pre-used story is making just sitting in an old website database or anthology. I've decided to feed Alfie Dog as many reprinted stories as it's hungry for. Here's my collection there so far. Have you used licensing services? What has been your experience? Are there others I should try? Ages ago, I had a job as researcher and content-writer on several series of books about indigenous peoples of the world. One of my favorite projects was on the Inuit. Somehow, reading about igloos and snowshoes completely captivated me. Imagine my delight to learn that there's a recent picture book about this wonderful culture. Even better, its author, Susan Margaret Chapman, agreed to be my guest and talk about her research for the book! 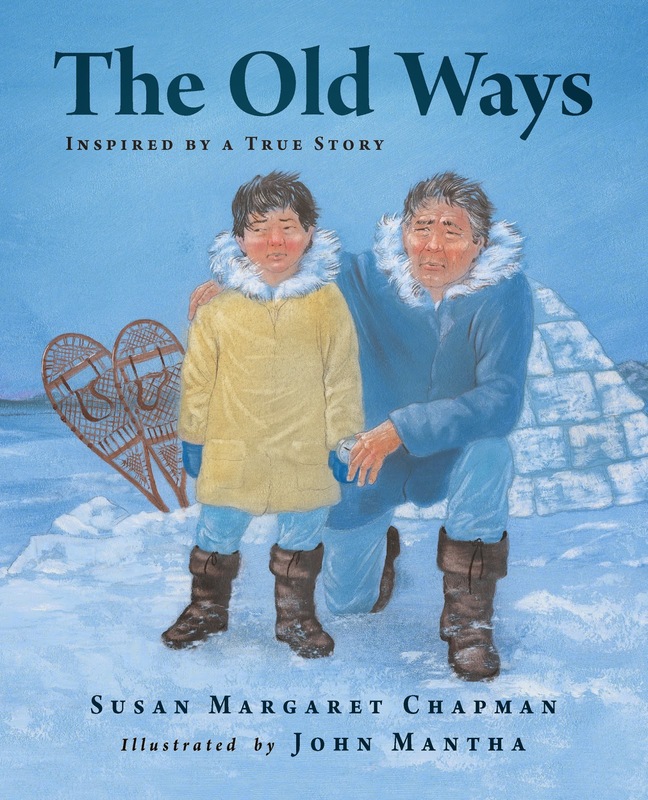 This picture book, which was inspired by a true event, is about a contemporary Inuit boy. Simon loves computers, TV and pizza, and is not interested in learning how to build an igloo, or in listening to his grandmother’s old tales. But when their snowmobile breaks down, and his grandfather builds an igloo and his grandmother helps to fill the waiting hours with many tales, Simon changes his view. The idea for The Old Ways came from a story that was in the paper. An Inuit family survived for over a week when their snowmobile broke down in a storm. I imagined a child who thinks the old ways are very out of date. He doesn’t want to hear about them. But when they are stranded, and his grandfather is ready with all his tools and builds an igloo to save them, I could see how the boy would change his mind. As a teacher librarian, I was always very interested in storytelling. I had a storytelling festival each year, and asked the students to go home and listen to stories from their parents and grandparents, and then tell them to us. Storytelling is a lost art, and is such an important thing to preserve, and to hand down family history. The storytelling part of the book seemed to flow as a natural part of the story. They were waiting to be rescued, and the grandmother tells him many stories, which, for the first time, he appreciates. And these stories are, of course, part of “the old ways”. I spent a lot of time checking that all my facts were correct re igloo building, seal oil lamps, clothing etc. When I was baffled about how there were sticks to hold up the cooking pot (when this takes place above the tree line) I phoned a school in Nunavut, and asked if someone could talk to me and check everything. I talked to the grade 4 teacher, and she reassured me that the wood sometimes drifted in, and they saved it. We also discussed things like what they would use in a seal oil lamp now instead of seal oil. I also spent a lot of time looking at folktales that would work, as I thought that students and teachers might want to go and read the actual folktales mentioned in the story. The story that Simon tells is a popular old story I used to tell called “The Fisherman and His Wife”. I loved doing the research, but became anxious about the accuracy of the illustrations, because they had to be right. I sent a number of notes and directions for the illustrator (who I never actually met or talked to directly). I have never been to Nunavut, but certainly hope to visit there eventually. Learn more about Susan Margaret Chapman on her website. Purchase The Old Ways on Amazon, Barnes & Noble, and elsewhere. As a writer who can draw a bit, I have huge admiration for people who hone their skills in both fields, and thereby can illustrate their own books. One great example is today's guest, Marla F. Jones. I love books. I love reading. As a first grade teacher and mother of two, I read literally thousands of children's books. So when I retired from teaching, I promptly joined the Society of Children’s Book Writers and Illustrators and began the on-line writing course at the Children’s Book Insider, or “the CBI Clubhouse.” My first real writing gig was creating curriculum activities for Augsburg Fortress Publishing. My first book, Ponder Porcupine, was written to supplement a piece of curriculum. Susan York Meyers, a published author and friend, graciously mentored me through the process of writing for children. I completed the Children’s Book Insider’s writing course (some parts more than once), joined a couple of critique groups, revised and polished, received additional critiques, revised and polished some more. I followed submission guidelines exactly and sent my manuscript to editors and agents. Rejections abounded, saying 'I like it, it just doesn't fit our line-up' or “really fun story, it’s just not for me”. So, I decided to put my money where my mouth is and publish it myself. But did I have what it takes to illustrate my own picture book? As a teacher, I enjoyed working with beautiful papers, creating colorful bulletin boards and games. So, I created a few cut-paper art illustrations for my story and asked my family, friends and colleagues if the pictures were good enough for a children’s book. Everyone gave me an enthusiastic “thumbs up”! I’m a folk artist. I am not classically trained but I’ve always had a deep appreciation for all types of visual media. Folk artists typically use bright, bold colors in a unique or unusual way. 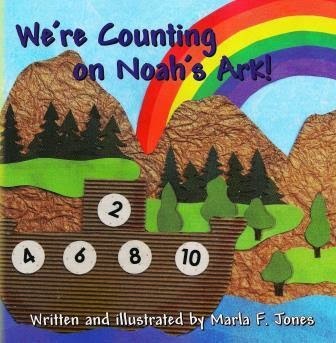 The illustrations for We’re Counting on Noah’s Ark! include colorful papers, fabrics and found objects. Look close and you’ll spy twigs, pinecones, and textural objects. I especially love repurposing. After all, “one man’s trash is another man’s treasure”! The layers are assembled then scanned. Scanning causes shadows to appear, giving it a fun, 3-D look. The paper and the scanner do the shadows for me! At this point, with my computer I add highlights, shading, and tiny details as well as fix imperfections. 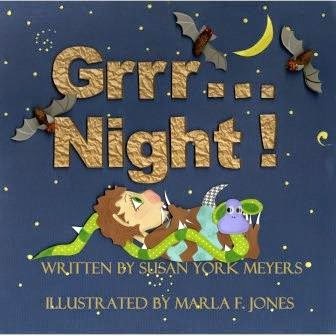 When author Susan Meyers saw the published book, We’re Counting on Noah’s Ark!, she liked the artwork and asked me to illustrate her picture book, Grrr…Night!. It stars a little monster who can’t go to sleep. My latest book, Let’s Follow Them!, came out in July 2014. I wrote and illustrated it, using the map of our city in the cover background. I work hard at my craft. Every day. I attend writing conferences, take classes, and soak up everything I can about writing and illustrating picture books. I’m also the co-founder of a group called Next Generation Writers. Our slogan is “nurturing tomorrow’s storytellers and artists.” We teach writing/illustrating workshops to elementary students and adults. What could be better? I get to do the things I love every day—teaching, writing and illustrating. Learn more about Marla F. Jones on her website. Purchase her books on Amazon.